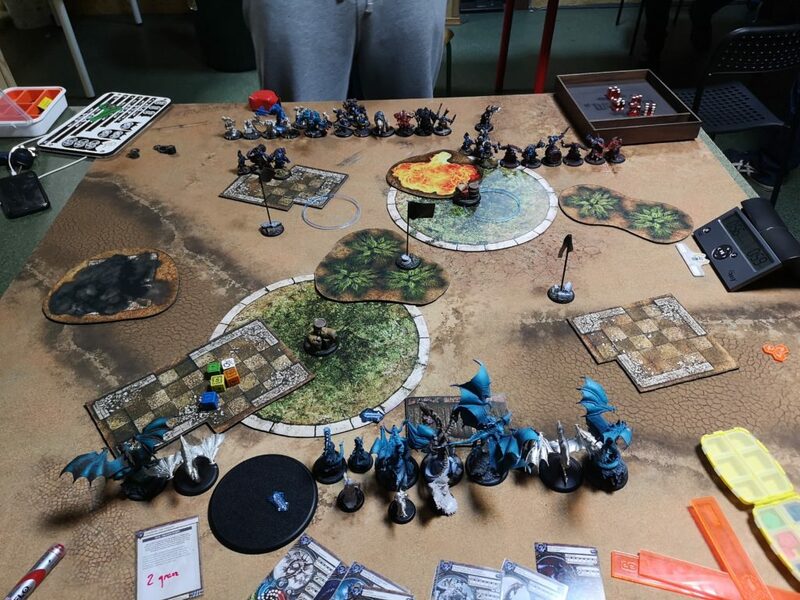 After an exhausting and demanding attrition game with Wiktor and was to play against Mateusz and his temporary romance – Trollbloods. 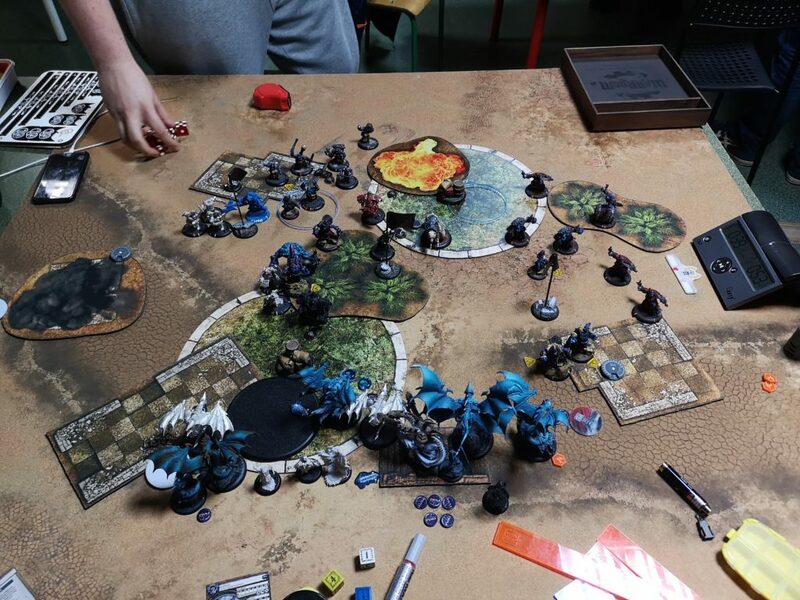 He fell in love with Borka2 and decided to play that particular list untill his Mercs arrive. He is already posting bat reps with his already full painted army and you can check it here. 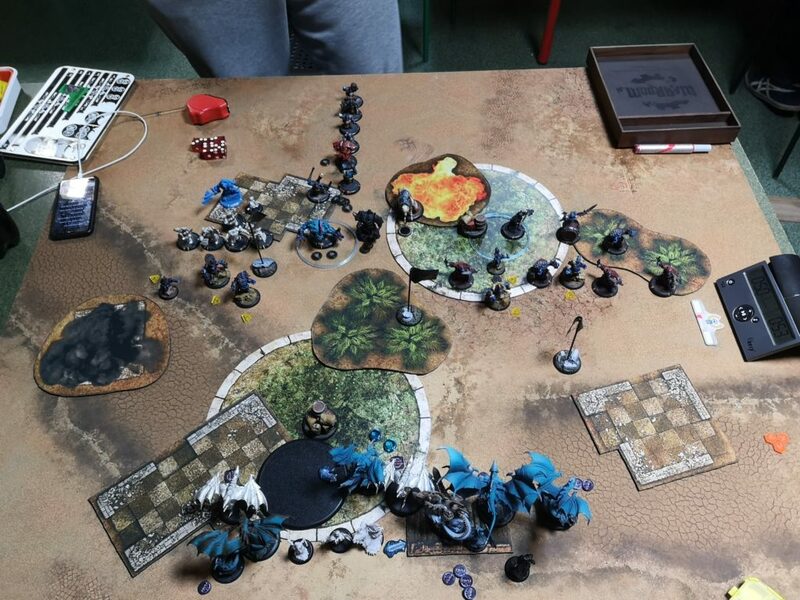 I decided to play my Thagrosh2 as part of testing his limits and trying to find what he cannot play into. I could expect this match up to be the one I should avoid but I wanted to play it nevertheless. As you can see I was going to face infantry focused troll army that can take one of my turns away by simply using Borka’s feat. I had to accept that and find a way to deal with that issue. My plan was to spray troll models during the feat and move in/out with my feat. I needed to keep my key models alive and try not to fall behind too quick scenario wise. 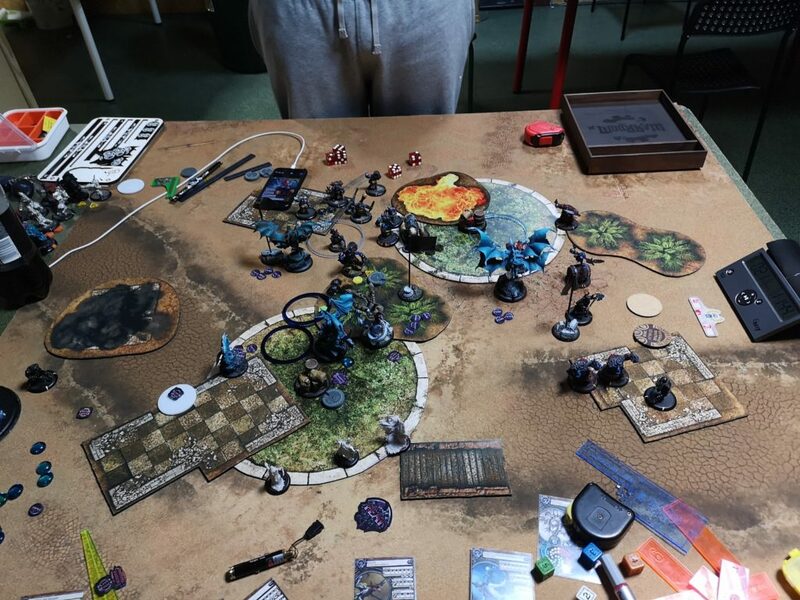 Mateusz won the roll and obviously decided to go first so he could gain table really quick and feat probably in his second turn. He deployed his forces centrally. 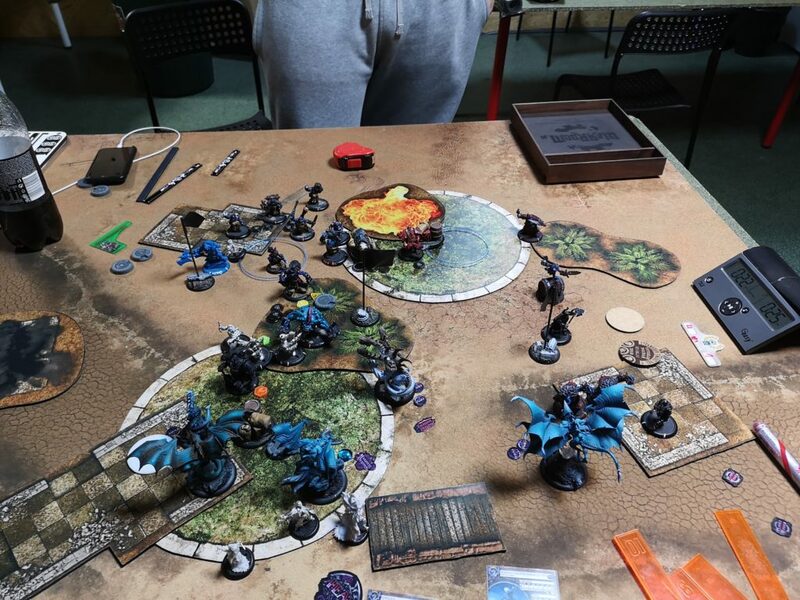 I deployed my battle engine on the left flank, Angelii and Hellions symmetrically on both sides, Thag2 in the middle with Typhon and Seraph nearby. Mateusz decided to put his advance deployed models on the opposite side of the board than my Throne. Mateusz run forward as far as he could staying outside of most of my threat ranges at the same time. Stone received couple of fury points. Fire eaters were set on fire. I run forward with my forces and tried to stay outside of his melee threats. If I would run too far I would end up with trolls already engaging my models and preventing me from moving anywhere or even killing them. I put my upkeeps on and prepared mentally to face what was inevitable – Borka’s feat. Obviously, Mateusz feated and moved his models up the table threatening this way with a strong retaliation with his second line in case I would be able to remove some of those models. 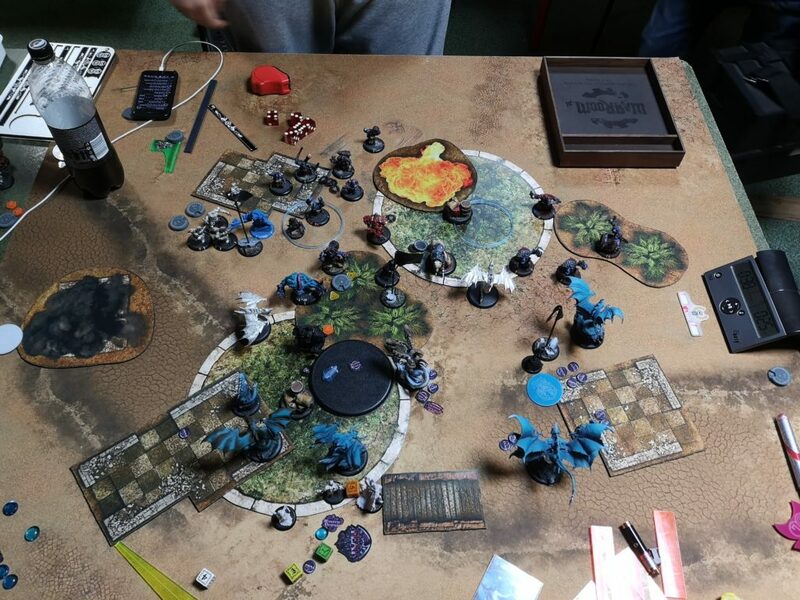 Additionally, Mauler moved up and due to his feat he was basically unkillable for a round there. Next round with +3STR he was going to be able to remove any model put in front of him. This round I had to remove as many models with shooting as I could and contest what was there to be contested. It was possible to capture 2 points and my plan was to do so. I used what I could, even Thagrosh joined with his powerful spray. Seraph surprisingly was able to kill something with his single shot. Hellion on the right flank sprayed and repositioned to the right cicrcular zone. Throne and Typhon failed in clearing enemy models in my zone. Unfortunately, with the very last movement I forgot about the Borka’s feat and instead moving in, spraying and repositioning toward the farthest flag, Hellion charged and became stationary… Because of the last Champion contesting my zone and not contesting the flag, we both scored one point on the flags, 1:1. Mateusz cleared his circular zone with ease. As predicted Mauler alongside with the last Champion and couple of other models removed Throne. Borka stayed safe back and his high value prevented me from doing a random caster kill. Mateusz eventually scored additional 3 points leaving me in a very difficult situation. The scenario definitelly wasn’t easy for my list. You cannot rely on Legion warbeasts if it comes to contesting the zones, not without a huge support of Fyanna for example or help of similar extent. The score was 1:4 in troll’s favour. I have found myself in a situation where there was little to nothing I could do to prevent Mateusz from winning. Reasonably, I could score only my circular zone and contest all the other objectives. Angelius charge far into enemy lines and cleared most of the models close to the flag. Seraph contested both the flag and the zone. I managed to kill all of the models in my circular zone, including Mauler. Unfortunately, I didn’t have resources to score any of the flags. I scored 1 point, 2:4. Mateusz effortlessly scored 2 more points that were needed to gain 5 points advantage and we shook hands. Being aware of that it was going to be a difficult game helped a little bit not to lose faith in Thagrosh2 😛 The scenario and that particular pairing seems to be very challenging. Winning the starting roll and chosing to go first would help. While playing into Borka2 I would need something that can stand in front of troll’s army and hold its position to contest effectively. Angelii are not the most survivable models in the game 😛 This game proved one thing for sure – it was not a match up for Thag2. I realised another thing too, Legion doesn’t have many models with immunity to cold.